La Feria de Abril de Sevilla, Seville April Fair began in 1847 as a livestock fair and was the outcome of an initiative by Narciso Bonaplata and Jose Maria de Ybarra, who applied for authorization from the city council to hold an annual fair on the 19th and 21th of April at Prado de San Sebastian, the on the outskirts of the city. It was in the 1920’s that the Feria took on its current form as an artificial city of casetas or huts. Its success was such, that in 1950 the livestock fair was separated from the purely festive part. 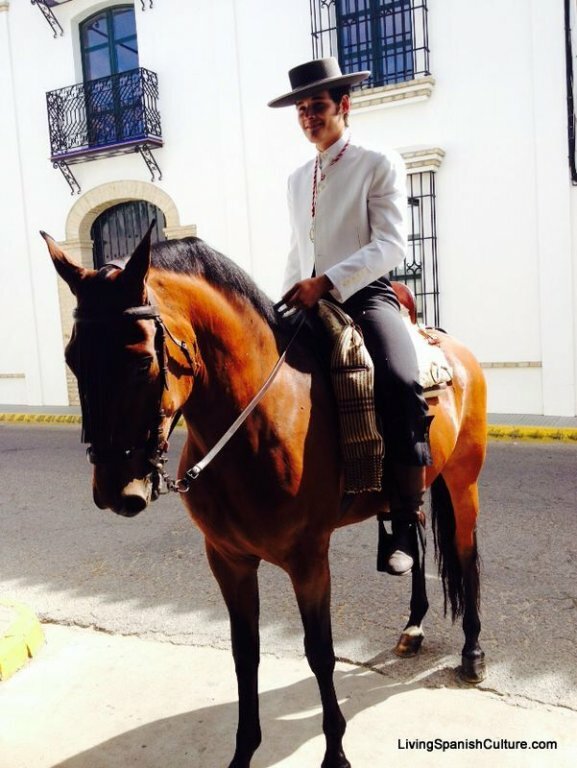 Since 1973 it has been held in the Barrio de los Remedios on a site occupying around 40.000 m2 which has around a thousand of casetas and streets adorned with thousands of fairy lights and is characterized by the typical coming and going of horses and flamenco dresses. 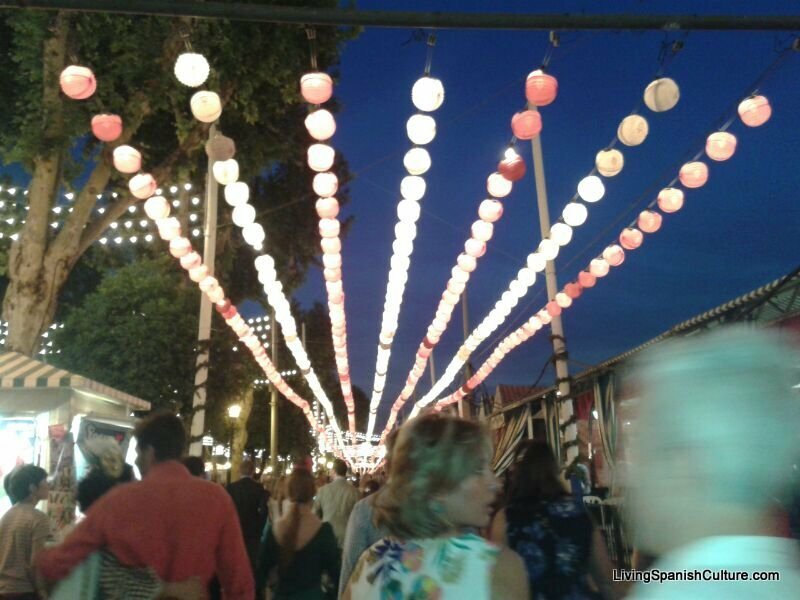 One or two weeks after Semana Santa, Easter starts with the ilummination of the thousands of bulbs that adorn the gate, and throughout the week, Seville takes on a festive atmosfere. 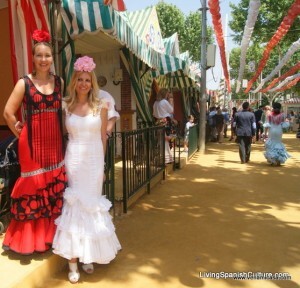 To describe the birth of the Seville Fair it must be based on two stages or periods in the history of Seville. 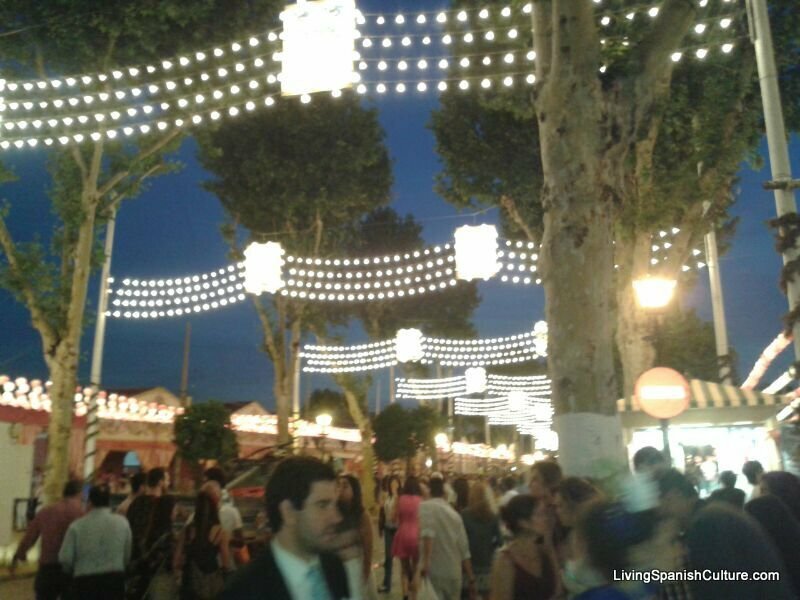 The first contact that has the Sevillian people with what we call fair, is from the hand of King Alfonso X, son of the conqueror Fernando III, who gave permission for the holding of two annual fairs, April and San Miguel in autumn. Throughout the years after the vicissitudes of Seville in economics and politics, the people of Seville cease to hold such festivals, which made over 1845 again restore the fair, after the losses of the French invasion, the full economic downturn, some industrial adventures (like so famous pottery of Triana and Carthusian found even in Greece) and hurricane in 1942 that devastated Seville. 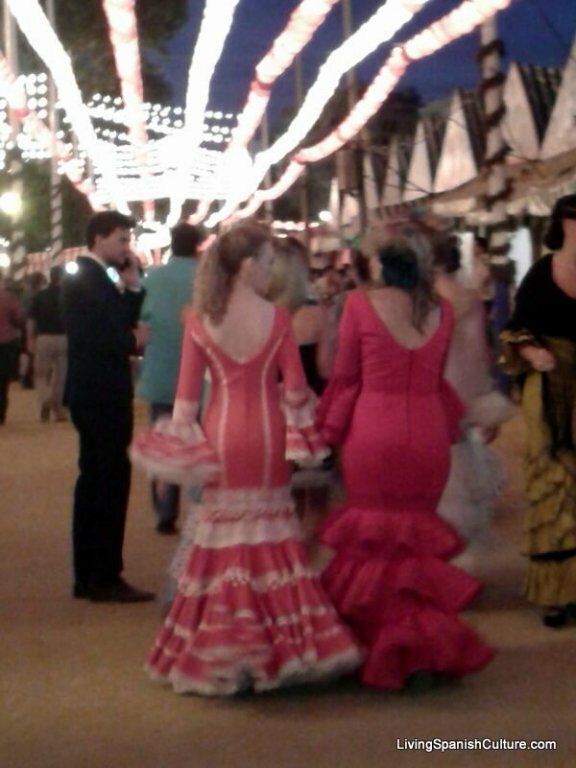 These parties were restored as revulsive for the Sevillian population sank into an economic crisis and spirit. Hard to believe, but if we rely on the story, is true. 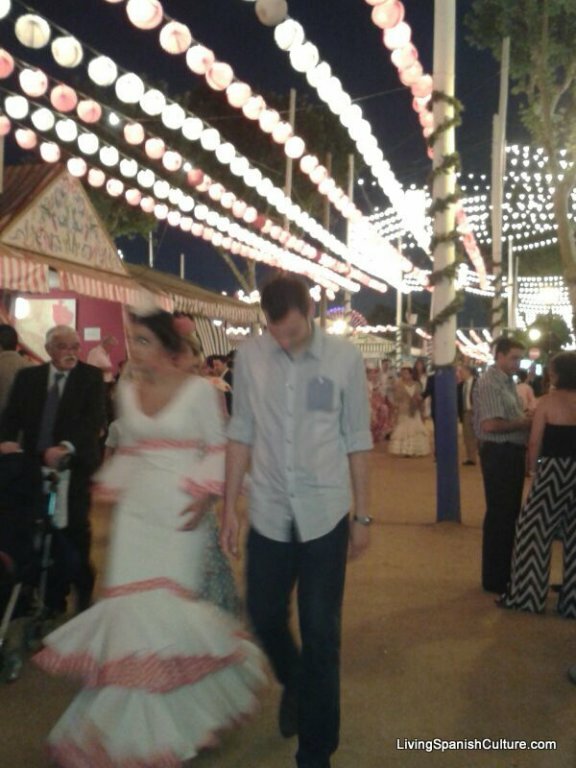 It was not the Sevillian people responsible for re-establishing what already was once belonged to them, in fact they where two councillors of the City of Seville: the Basque Jose Maria Ybarra and the Catalan Narciso Bonaplata, both had the magnificent idea of restoring two fairs in Seville, the April and September Fairs. 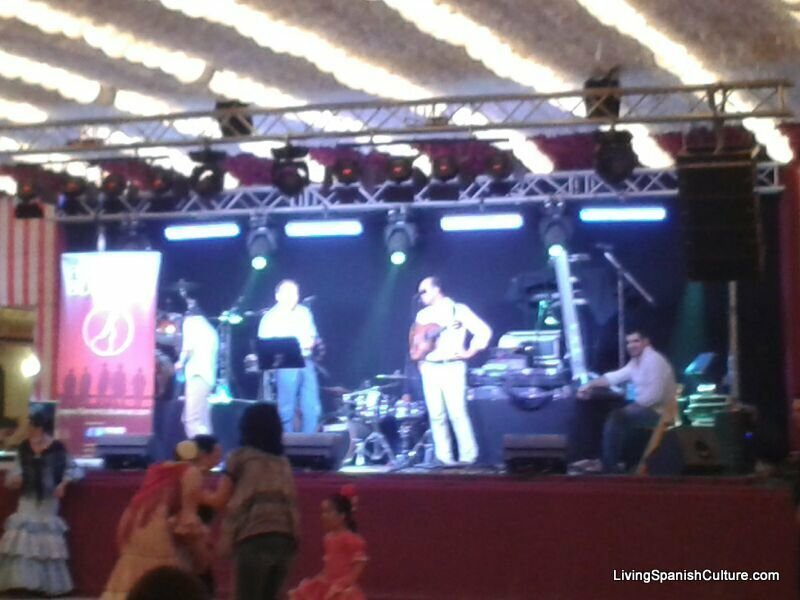 With the passage of time alone would win the April Fair with more public agglomeration and fame in all Spain. 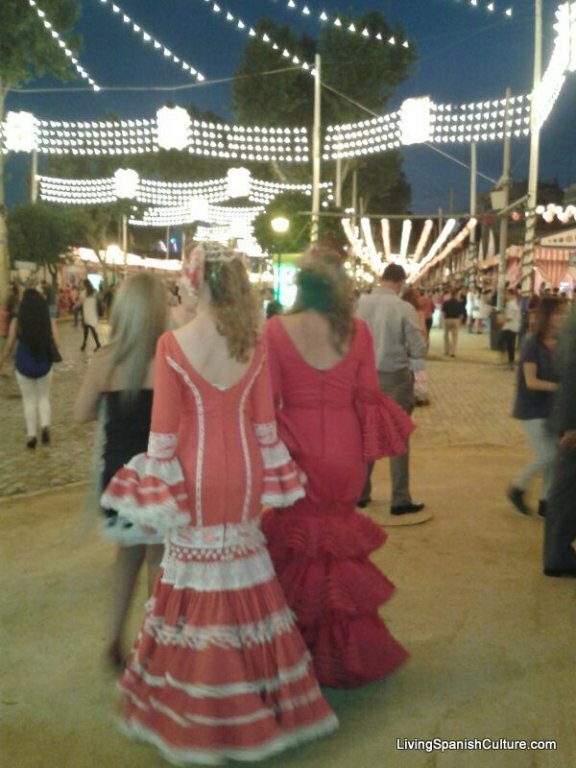 But it was the Sevillian people who made fair April resurface each year without losing any of their same traditions, songs, dances, joviality and fresh air with every year to this days maintains the Week Fair in Seville.Thus it began on April 18th, 1847 the first “new fair” or the first in modern times. 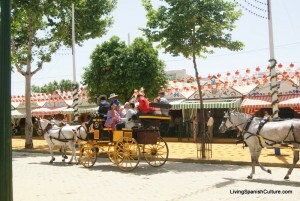 It was stood at Prado de San Sebastián with 19 casetas (houses) and such agglomeration public join the Fair, that the following year a greater number of security officer was requested because the Seville and Sevillian with their songs and dances hampered the main task of the fair: the exchange and the sale of cattle to the public. The Fair in our times has changed a lot. 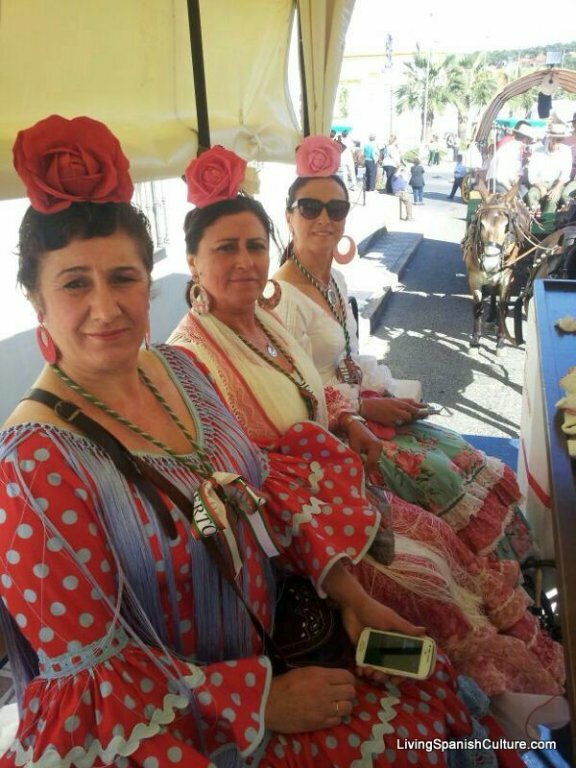 What began as a simple trade, it has been becoming so popular that today is considered one of the most popular and traditional events that show the joy and color of all Sevillian, Sevilla image and Andalusian character and beyond international borders being very popular and characteristic of Spain. 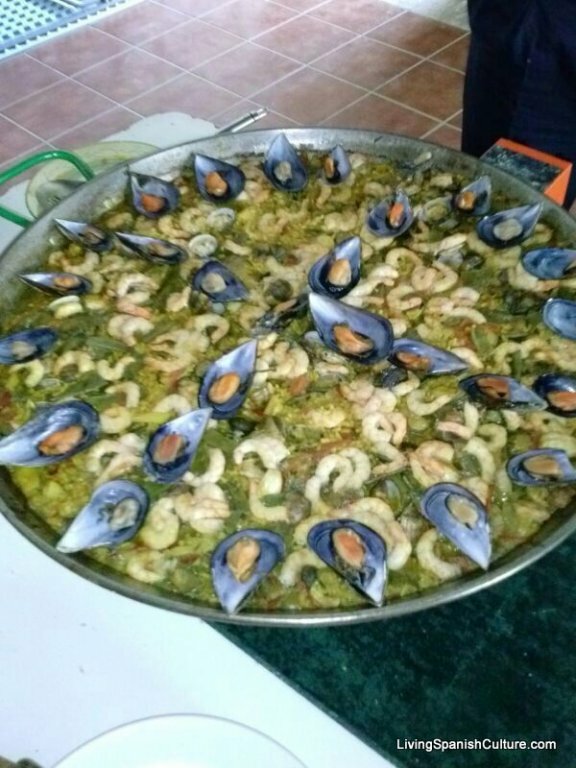 Since 1973 the new location is hold in the neighborhood Los Remedios, lands that were rescued from the Guadalquivir river after its works. The caseta has two different areas: the front or noble open to the street, where friends and relatives live and enjoy the fair and the back room where the kitchen is located, also the bar and toilettes. 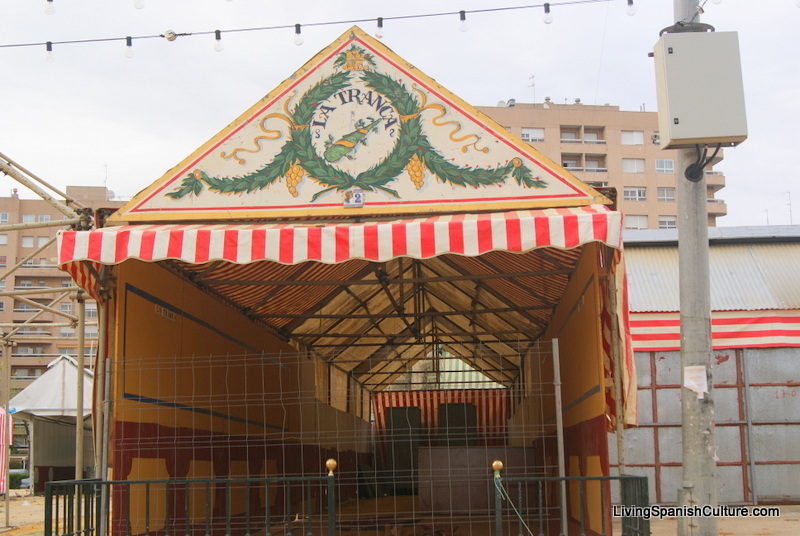 The current extension of the entire fair ground, is approximately 450,000 m2, as stated above, the fair began with at least 19 casetas, today has about 1048 casetas and are thinking about the possibility of extending the current surface. 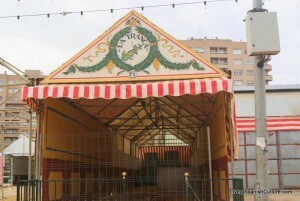 The main structures of the Fair are the casetas, as it houses that give life to the fair that is where the entire population gathers to give life to the fair, there are a number of features that is necessary to emphasize; as are the streets that form the enclosure, calls long streets of 10 meters long and cutting those long, short of 7 meters in length forming the fairgrounds, much like a Roman structure that is a rectangular planimetry in they were about long north-south avenues, perfectly cut by short streets from east to west. The real characteristic of these streets is its name. 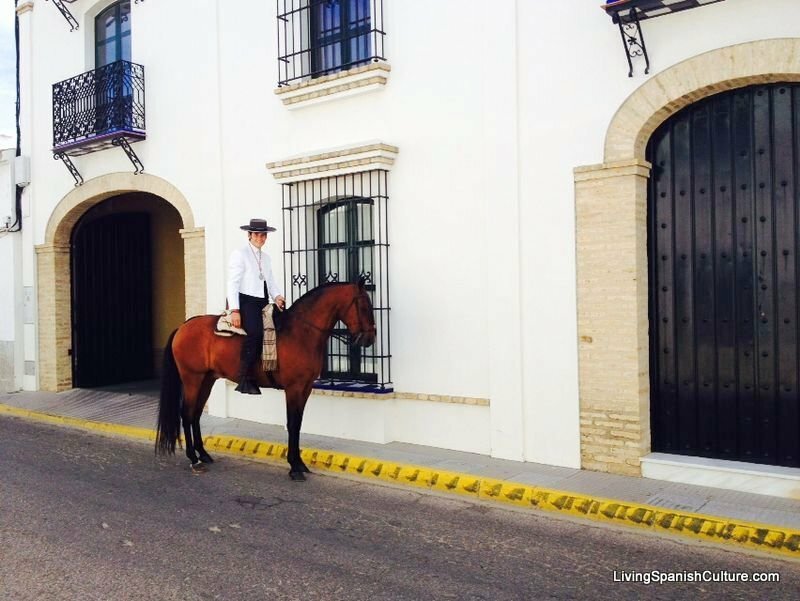 Every street has the name of an important torero (bullfighter) including Seville Curro Romero figure, or the father of modern bullfighting : Juan Belmonte. 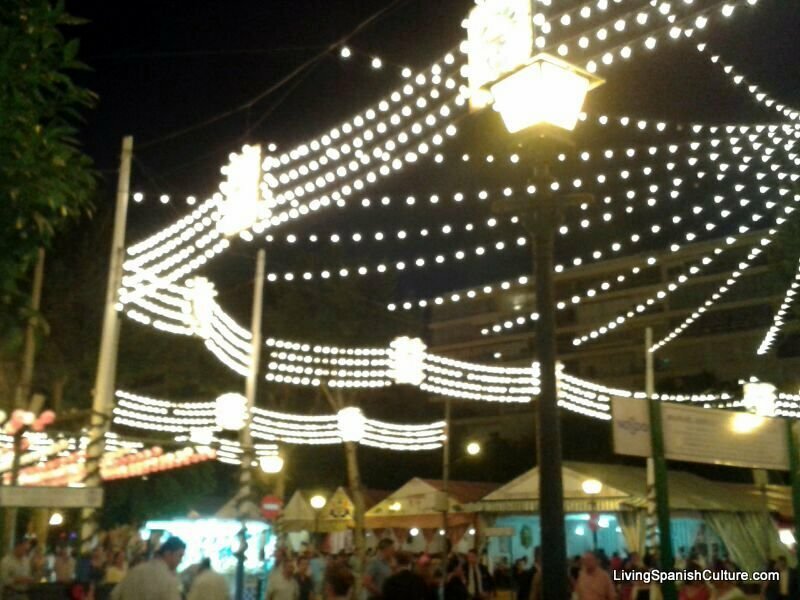 Lights and ornaments of the streets play a very important role to integrate into the joyful spirit of the fair, all the bulbs in the streets are decorated with “farolillos” lanterns, which are small balls of paper that are placed around the bulbs in the streets to give a different color, almost always have very characteristic drawings show such as cheerful, bright and polka dots color. La Portada (cover), What’s the cover? 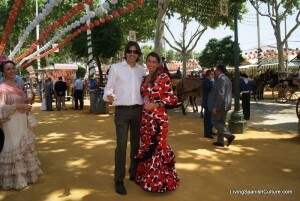 anyone who does not know what is the Seville Fair wonder…, any Sevillian would say the meeting point, would be right in part with that definition, because at La Portada is the place where the group of friends meet before entering the fairgrounds, but La Portada is the main entry. Each year La Portada has a new design and a different structure, each year a different Sevillian architect who makes the structure and always inspired by a building, anecdote or historical moment of Seville that identifies the city. 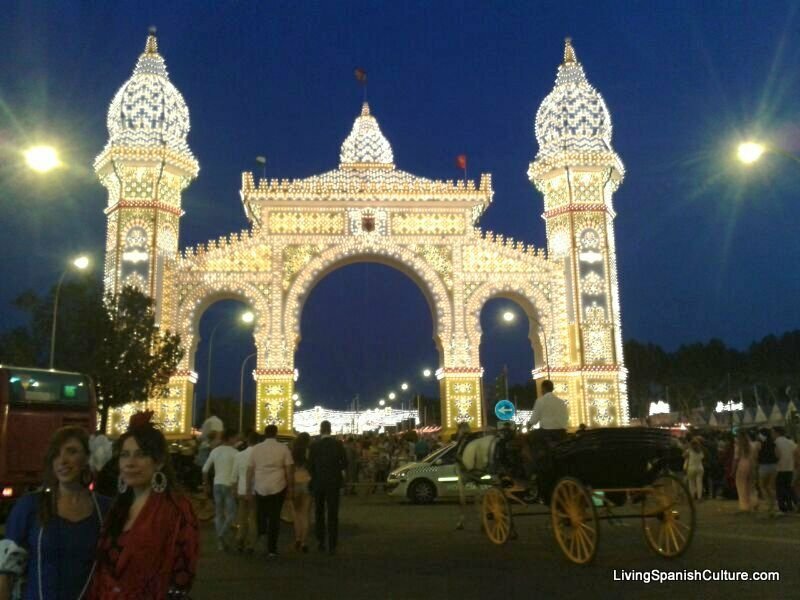 Portadas of April Fair in Seville.pdf from 1990 t0 2016. CREATION, CONSTRUCTION OF THE MAIN DOOR OF THE FAIRGROUNDS OF THE FERIA DE SEVILLE. 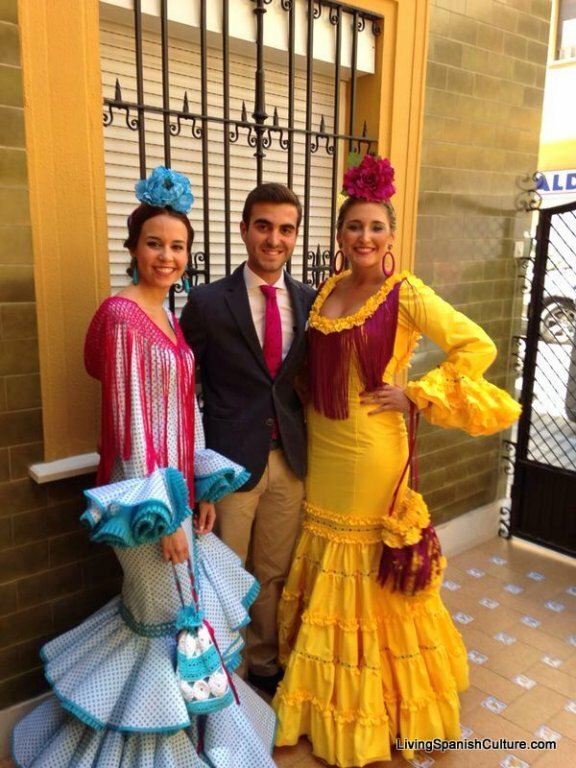 The flamenca dress is typical and traditional clothing of women to flamenco and Seville Fair, is the representation of female beauty made sewing, is a fitted suit to the ankles which features a series of leaflets in beautifying both in the lower area of the suit and sleeves. 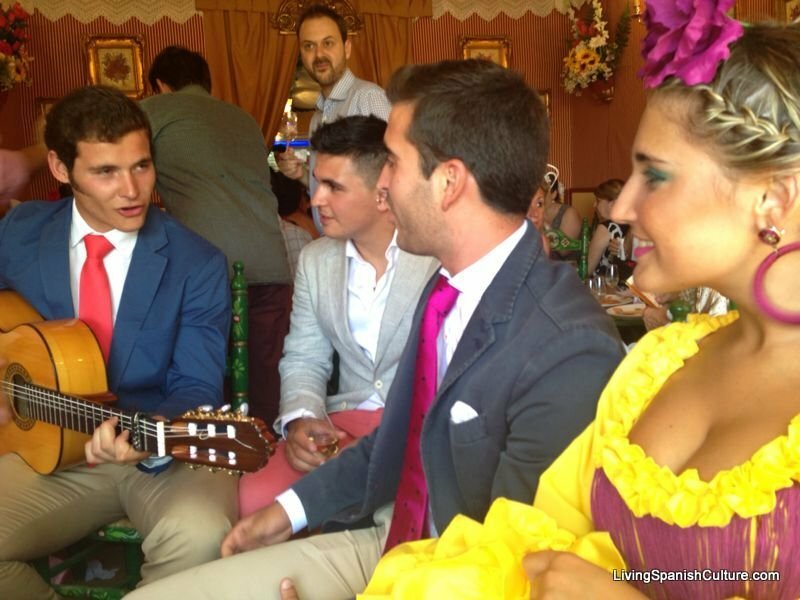 The tight is the only traditional costume of Spain that is still fashionable, transcends time is changing, be reformed with modern fashion, with the passage of time. 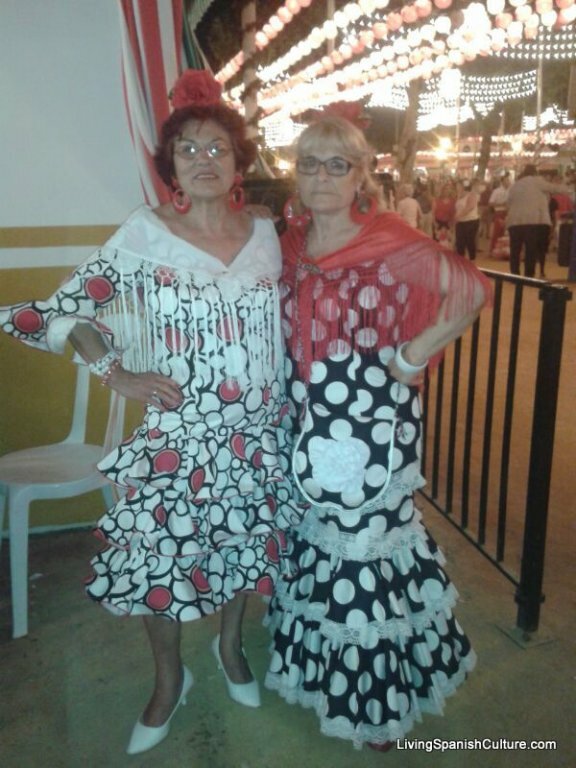 Fashion changes and returns to the traditional costume of Andalusia in costumes short flamencas, the short flamenco dress is the costume instead of reaching to the ankles reach the knees were carried back in the 60s and it makes thing a few years they turned into fashion. 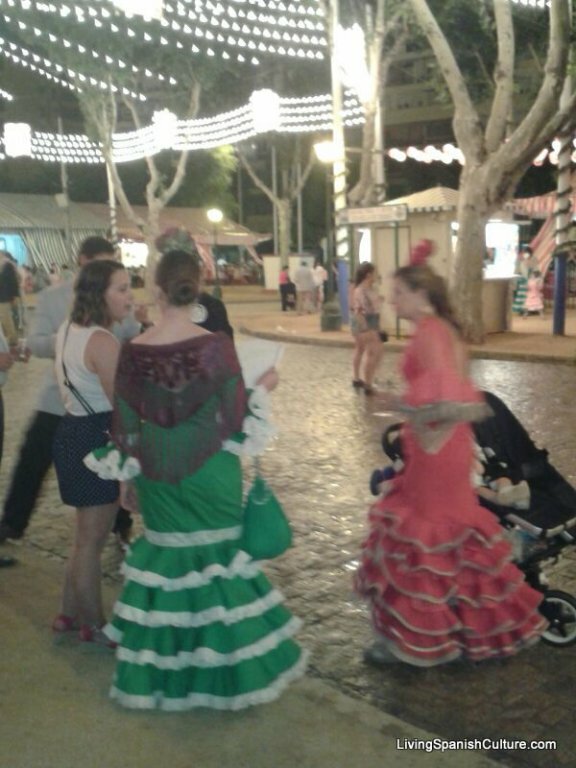 There is also the difference between the costumes of day and night, usually at night are suits duller colours in many cases black and sleeves three-quarters or long and in the case of suits day are brightly coloured suits and short sleeves by the heat of the day and cool night in Seville. Normally male suits matching with her dress, business suits without tie for evening and light colour shirts for the day. 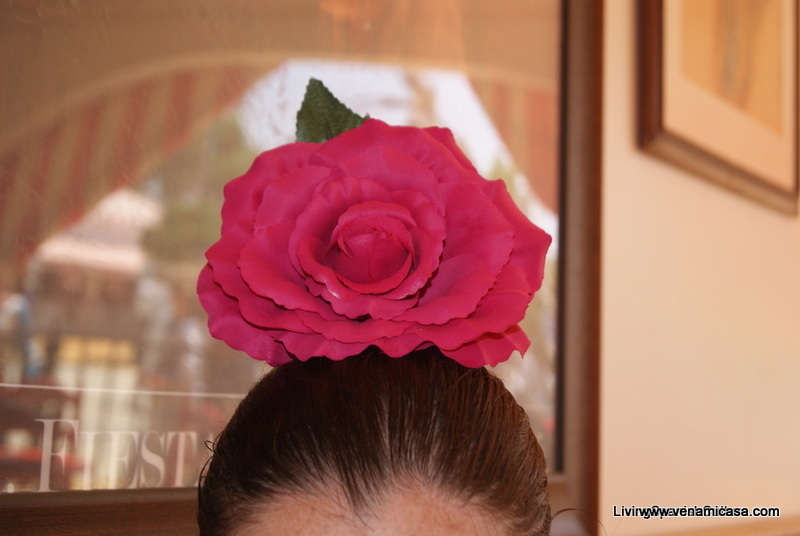 The most typical costumes are smooth patterns with bright colours or polka dot prints which is accompanied with hair up, in the case of the Sevillian woman flamenca which is custom or tradition placed the famous flower in the center of the head and in the case of the Cordoba flamenca woman usually collected hair aside and placed the flower below the ear mostly letting the hair down. This trend is accompanied either by small combs or comb behind a large flower. It is tradition that flowers are artificial but that depends on the fashions that may arise later that year. Normally the suit is accompanied by various accessories; the small shawl, necklace, bracelets or flamenco heels, in these supplements are mostly game each to combine and liven up the own costume.